Facts about Pekingese Dogs, "Scientific name for Pekingese Dog, or domestic canine, is Canis lupus familiaris". 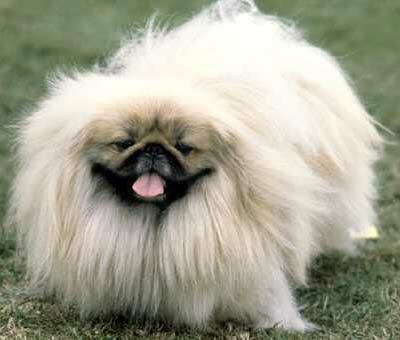 The Lion-Dog commonly known as Pekingese Dog is an ancient breed that is originated in China. The Pekingese Dog are used as a toy dog and they resemble to the Chinese guardian lions hence named as Lion-Dogs. Their name refers to the ancient city of Beijing (Peking) and here is the residence of the Forbidden City. Nowadays the Chinese princes own the Pekingese Dog and in ancient time they were the companions of the Buddhist Monks of Chinese. They have been crossbred nowadays with Maltese to make peke-a-tese because of the characteristics they own. Pekingese Dogs sweat glands are between their paw pads. It is a Fact a Pekingese Dog sees in color and have better low light vision. Pekingese Dogs have three eyelids, a lower lid, an upper eyelid lid and a third lid, that is called a haw or nictitating membrane, this keeps the Pekingese Dogs eye protected and moist. Pekingese Dogs eyes have a special membrane for seeing better at night, called a tapetum lucidum - a dogs reflective layer in the choroid chiefly of nocturnal, causing the eyes to glow when light at night hits the eyes and they consist of some layers of smooth flat cells covered by a section of double deformed crystals. - The Pekingese Dog breed has hardly changed for over 2000 years. The Large eyes and flat face are some of the most important characteristics of this breed. The Pekingese Dogs body is durable, muscular, and low to the ground. - The Pekingese Dogs are of different colors like red, white, black, tan, gold, cream and sometimes grey or blue. The Pekingese Dog pigmentation is very poor and they have light eyes. There are also Albino Pekingese Dog with pink eyes and white body and they should be bred cautiously as because of albinism problems. Female Pekingese Dogs are in heat for matting for about 20 days twice a year. Female Pekingese Dogs are pregnant for 60 days before they’re puppies are born. A Pekingese Dog is an omnivore, (definition-they eat both other animals and plants). All Dogs are direct descendants of wolves. - The norm for these Lion-Dogs the average height is 6 to 9 inches (15.2 to 22.8 cm) and the average weight is 8 to 10 pounds (3.6 - 4.5 kg), if the Pekingese Dog is under 6 pounds (2.7 kg) it is called a sleeve Pekingese Dog. It is the smallest member of the Pekingese Dog family. and however there is a possibility that the Pekingese Dog may be smaller sometimes. A Lion-Dog is disqualified in the show ring which weighs more than 14 pounds (6.3 kg). The Pekingese Dog are slightly longer than tall as when they are measured from the front part of the chest to the buttocks. The approximate ratio is 3:5 for height and length. A Pekingese Dog’s mouth can apply approximately 150 to 200 pounds of pressure per square inch and an American Pit Bull Terrier, German Shepherd Dog and a rottweiler can have 320 LBS of pressure on avg. All dogs are identical in makeup big or small– 42 permanent teeth and 321 bones. Pekingese Puppies have 28 teeth and when they become adult Pekingese Dogs they have 42 teeth. When Pekingese puppies are born, they have no teeth and are deaf and blind. Pekingese Puppies for their first few weeks will sleep ninety percent of the day and their vision is not fully developed until after the first month. - The UK Kennel Club survey found that a median lifespan of these Pekingese are 11.4 years. The Pekingese Dog mostly die because of trauma just like the other toy breeds and it mostly includes neurologic and cardiovascular failure. The number one heath problems amongst Pekingese Dogs is obesity, so always make sure your dog doesn't get to fat. Many foot problems that Pekingese Dogs have are just an issue of long toenails. The other problems are the breathing problems and the eye issue due to small skull and flat face. The Pekingese Dog commonly have eye ulcers and some of them may suffer from Dry eye and (PRA) Progressive Retinal Atrophy disease. Some of the health problems that the Pekingese Dog is Intervertebral Disk Disease, Exposure Keratopathy Syndrome, Mitral Valve Disease, Keratoconjunctivitis Sicca, Hydrocephalus, Fold Dermatitis, Entropion, Ectopic Cilia, Distichiasis, Cryptorchidism, Cleft Palate, Cataracts and Brachycephalic Syndrome. - The Pekingese Dog should be always kept inside the house as a long exposure to outside may cause breathing problems in them. Their short legs are also a problem and some older dogs may not be able to climb stairs. - The Pekingese Dog coat should be kept healthy and should be daily brushed and should be taken to the groomer every 9-12 weeks. Dirt should be removed from the Pekingese Dog eyes and from creases on their face daily to prevent from hot-spots and should maintain the fur in the buttock area clean. Since the Pekingese Dog have a lot of fur, they should be kept cool or else long exposure to high temperature can cause heatstroke. Pekingese Dogs have two times the amount of ear muscles than people. It is a fact a Pekingese Dog can hear a sound at four times the distance of a human. Sound frequency is measured in Hertz (Hz) Def-Hertz is the measurement of frequency, explicitly it's one cycle per second. The higher the Hertz are, the higher the pitched the sound is. Pekingese Dogs hear best at 45,000 Hz to 65,000 Hz, while humans hear best at around 20 Hz to 20,000 Hz. Only humans and dogs have prostates and a dog doesn't have an appendix. Pekingese Dog’s nose prints can be used to identify them, their nose prints are like a humans finger print. It is a Fact a Pekingese Dog smells more than 1,000 times stronger than that of a human. A Pekingese Dog’s nose, secretes a thin layer of mucous that helps it absorb scent, after that they lick their noses and sample the scent through their mouth. - It was the custom of carrying small dogs in sleeves by Chinese Imperial Household in their robes worn, hence named as sleeve type. This practice came into existence because of holding the new born tightly for many hours after their birth. - These were believed to be originated from Buddha and they were considered as temple dogs. These were believed to be made to destroy little and small demons that may harm the temple. Pekingese Dogs pant to keep cool with 10 to 35 breaths per minute with an average of 24 breaths per minute. A large dog breed resting heart beats between 60 to 100 times per minute, and a small dog breed’s heart beats on average between 100 to 140 pant a lot. If purchasing a Pekingese Dog from a breeder, make sure to find a good breeder with references check at least two to three of the puppies that were purchased from this breeder. The Pekingese Dog belongs in the Toy Group and in 1906 they were recognized (AKC) American Kennel Club.